Loadpoint Bearings is a leading manufacturer of Air bearing spindles based in the United Kingdom. 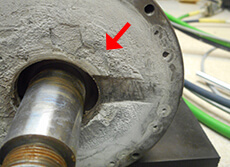 It is one of the more common air bearing spindles we repair here at High Speed Technologies, Inc. The above Loadpoint D03541 spindle was sent to us from a local Thermal Management Specialist. They specialize in ceramic substrates for laser diodes and high powered microelectronics. The spindle was received with a note that said “spindle is making a loud whine.” Upon initial test run we were able to duplicate their complaint. The spindle ran very loud at partial operating speed. One of the contributing factors was certainly the amount of ceramic material that had built up on the wheel mount and behind it. The air escaping out of the front end of the spindle and the rotation of the wheel mount itself combined with the uneven surface of the built-up contaminants caused a loud resonance or whining noise. But that was not the only problem we found. The spindle also failed axial thrust tests. So we fully dismantled the spindle to investigate further. The reason for the low Axial thrust is pictured above. The outer axial thrust bearing was damaged. At some point the rotating shaft made contact with the thrust bearing and damaged it. This may have also contributed to the customers original complaint. We restored this bearing to new condition in our fully equipped machine shop. The spindle also failed initial pressure testing. We pressurized the coolant circuit and found the leak to be originating from the coolant fittings themselves. There were already indications of an existing leak at this location so it was not difficult to find and eliminate. We replaced the coolant fittings with new, coated the threads with liquid PTFE sealant and this stopped the leak. Prior to reassembly all components are cleaned meticulously. 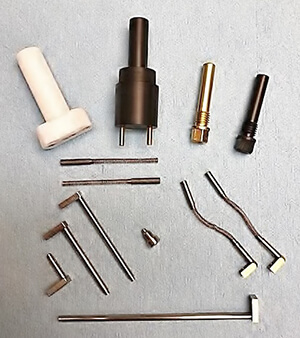 All air jets and air paths to and within the spindle are free of any and all contaminants. Otherwise the spindle will fail upon test run! We also make sure the brush button on the shaft is square and smooth. And of course we always replace the carbon brushes with new or provide a new set. HST can also provide additional new spring mounted brushes upon request! Please keep in mind that we can also provide additional new spring mounted brushes upon request! We also have many other brush related accessories in stock! So if you feel your brushes are worn or require such accessories, just give us a call! We have a large stock! For expert Loadpoint spindle repair, please email or call us at 603-483-0333 for a free, no obligation quote. We offer one-year-warranty and Quick-Turn-Around. We are fast, experienced and our work is guaranteed! !